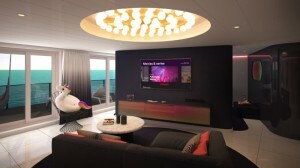 Today Virgin Voyages released the designs and images of its RockStar Suites, which will debut on Scarlet Lady when she sails from Miami in early 2020. The Scarlet Lady will have 78 RockStar Suites, 15 Mega RockStar Suites, which are made up of Two Massive Suites, Two Fab Suites, Two Posh Suites, and Nine Gorgeous Suites. The top suite onboard Scarlet Lady will be The Massive Suite, there will be two of these on board the ship and will sit atop the bridge of the ship, these suites are a huge 2,147 sq. feet. Highlights of The Massive Suite include its very own guitar-clas music room, views of the ocean from every corner of the suite, and a massive terrace complete with its own outdoor shower, hot tub, hammocks, and a runway outdoor dining table, where a staircase will help guests make their way on top of the table for dancing. At the center of the Massive Suite is a circular oversized couch set up, perfect for conversation and cocktails from the suite’s adjacent in-room bar. The Fab Suites onboard features a wall that separates the space into bedroom and living areas. The living area features room for friends, with a sofa that converts to sleep two, an extra half bathroom and an entertainment credenza. The suite bedroom area features a large wardrobe while sunning on the terrace is encouraged with an outdoor shower, stargazing loungers, a sofa, terrace hammock, and champagne table. Posh Suites can sleep up to four with separate living and bedroom areas. On the terrace are outdoor showers, stargazing loungers, a sofa, terrace hammock, and champagne table. The nine Gorgeous Suites have an open floor plan with a distinct lounge and bedroom areas, plus a luxurious marble bathroom with shower window, and an expansive terrace with an outdoor shower and more. In addition, there are 18 Brilliant Suites, 14 Cheeky Corner Suites, 24 Seriously Suites, and 7 Sweet Aft Suites. The RockStar Suites will be positioned near the top of the ship, with all suites purposefully configured to maximise the view of the ocean. Many of the ship’s suites will feature a Peek-a-Boo shower, an all marble shower with a dichroic glass window carved in the center. 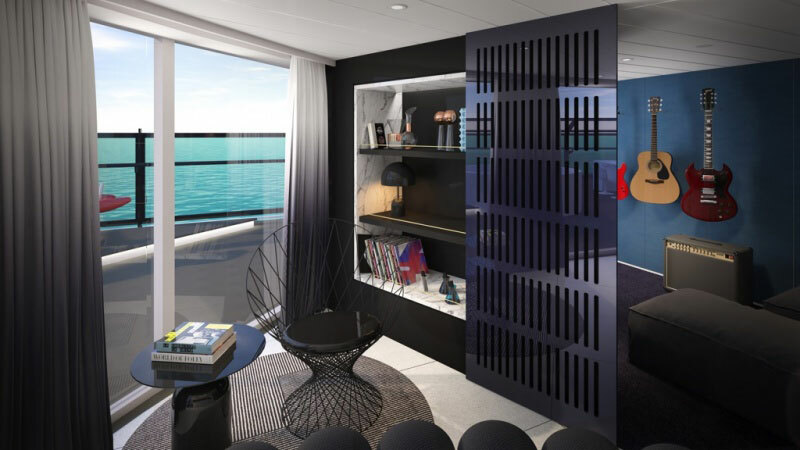 In addition, guests in the RockStar Suites will receive a number of perks, including a private lounge area, priority access to onboard entertainment, restaurants, and Shore Things, a private transfer to and from the ship in Miami and an exclusive express VIP pathway to the ship during embarkation. RockStar Suite Sailors will have their own wardrobe team to help unpack and repack, complimentary pressing service and nightly express swimsuit drying service. Suites will have a full bar and cocktail kit “fit for a rockstar,” with the first round on the house. Scarlet Lady will officially be on sale on the 14th February 2019 and The Sovereign Cruise Club is one of the preferred agents in the UK. For more information on Virgin Voyages please call our cruise experts on 03331 22 44 66.